White light is the part of the electromagnetic spectrum visible to the human eye and standard security cameras. 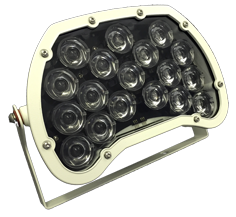 360 Vision Technology’s advanced Sirius LED white light equipped CCTV security surveillance camera range and standalone LED white light illuminators can be used to direct attention towards, and alert operators to any specific threat, providing effective white light up to a range of 200m. As white light is visible to the human eye, it can be used within CCTV security surveillance systems as a highly effective visual deterrent. Additionally, white light can be deployed to support on-site health and safety management, providing safe and secure night-time working conditions.